In the tradition of American tall tales comes the story of Josh McBroom, his wife, Melissa, and their family of eleven red-headed children. Swindled by Hector "Heck" Jones, McBroom hands over his last ten dollars in exchange for a marshy pond eight acres deep. He figures he's completely doomed, but his luck changes when the pond suddenly dries up and everything he plants on the farm grows at record speed. Heck Jones would do anything to go back on the deal he made with McBroom, but the McBroom family is too smart for that! This story is a fun tale of good triumphing over evil against all odds. Kids as young as four can appreciate the silliness of McBroom's good fortune, and they will love cheering him on against mischievous Heck. The repetition of the kids' names as one continuous word - "Willjillhesterchesterpeterpollytimtommarylarryandlittleclarinda - is a fun aspect of the story and one that would make it an instant read-aloud hit with any group of early elementary schoolers. I also like that each of the kids has a signature move that he or she does each time the family gets excited about something. Nose twitching, arm flapping, and teeth whistling are great actions that kids listening to the story could even try to imitate. Kids love to be silly, and they love to feel like they are in on a great joke. This book understands that natural inclination and plays with it, giving kids a great story that will inevitably give them the giggles. 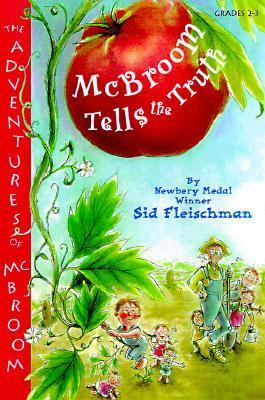 Recommend McBroom to readers who have loved stories about Pecos Bill and Library Lil, and to readers with wild imaginations who enjoyed The Stories Julian Tells and love to spin yarns of their own. Other McBroom stories are also available, including McBroom and the Big Wind, McBroom's Ear, and McBroom's Ghost.